September 20, 2014 by The Junkie 0 comments on "Cantonese Phrases – How To Introduce Yourself in Cantonese"
Are you Cantonese Beginner? Of anything that you’ll ever need to learn, it’s Cantonese introductions. When its time to speak, and you don’t have a set introduction prepared, you’re going to fail. Or you’re just going to give off the feeling that you don’t care about speaking or learning. And most learners out there, above all, just want to speak and be understood in Cantonese. The easiest way to do it? Because who doesn’t start with introducing themselves? Everyone does! Learn to introduce yourself in Cantonese and you’ve got 1/3rd of a Cantonese conversation squared away. The rest are topics of interest and closing greetings. So, here’s what you’ll need for a self Cantonese self introduction. In other words, this is your elevator pitch that you’ll use over and over. Important: You should know your Cantonese tones in order to get the pronunciation right. In the jyutping (romanization), the tones are marked by numbers as you’ll see below. Otherwise, understand that pronunciations written in blue are not 100% accurate. If you’ve not started learning your tones yet, this will help you as a beginner to properly sound the phrases out – just to give you a better idea of the sound. So, let’s say you’re American. America in Cantonese Chinese is 美國 (mei5 gwok3) and adding 人 (jan4), the character for person, turns the word into “American.” You already know that 我 (ngo5) is I.
I am (number) years old. Pronounced as: Naw hai yee sahp soee. 5. Your occupation. How to say “I am a student (etc.) in Cantonese. If you wanted to say you’re a student in Cantonese, you’d just add that word in. Pronounced as: Naw hai hok saang. So, here’s your introduction script you might want to use. Is it completely perfect? No! But it gets you speaking right here, right now and launches you into learning even more Cantonese. And that’s the best part. Use the scripts below. 你好,我叫 (your name). 好高興認識你.我係美國人.我 (number) 歲.我係 (occupation). Nei5 ho2, ngo5 giu3 (your name). Hou2 go1 hing3 jing6 sik1 nei5. Ngo5 hai6 mei5 gwok3 jan4. Ngo5 (number) seoi3. 我係 (occupation). If you’re interested in learning more Cantonese, check out the video lesson below. 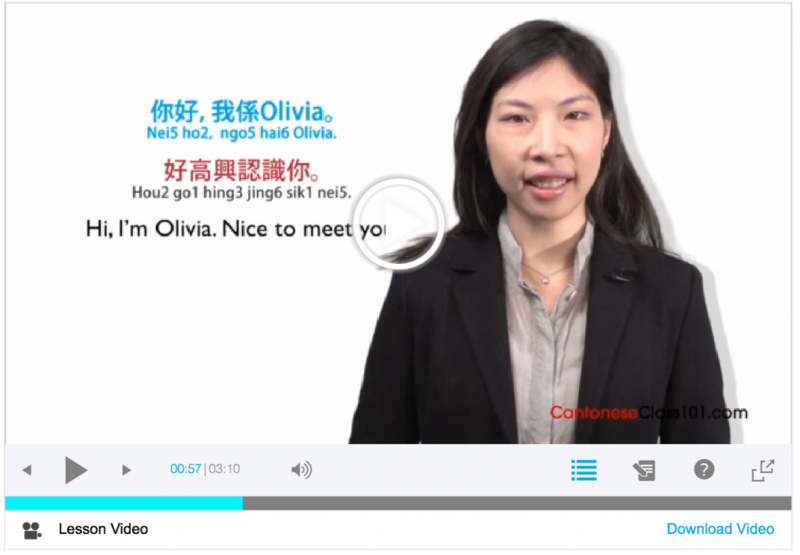 I use CantoneseClass101’s lessons to learn how to introduce myself. Want to learn even more Cantonese? Get even more lessons & start mastering the language. Click here to Sign up at CantoneseClass101 for free and get more lessons.